2 High quality Pfeil Swiss made cutters – safer and easier to use than cheaper tools. 2 A5 Soft Japanese vinyl – much easier to cut and manipulate than traditional ‘Lino’. 1 75ml Safewash ink – good density and easy to clear up with soapy water. 4 A5 high quality ‘Heritage’ paper. 6 A5 Newsprint for proofing. 3 wooden spatulas for ink spreading. 1 wooden spoon for print burnishing. 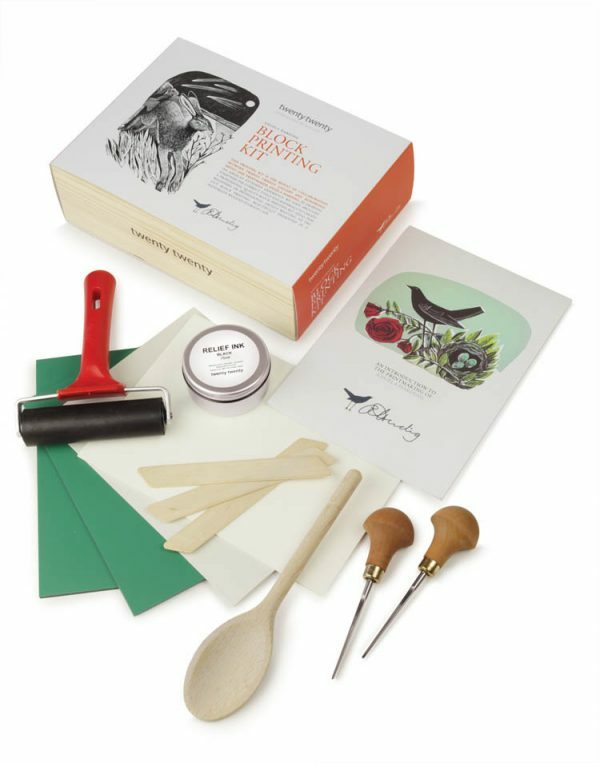 Also included is Angela Harding’s ‘Introduction to Printmaking’ which provides detailed instruction and lots of hints and tips to help you achieve great results. All contained in a hand made wooden box. Ideal for beginners or professional artists wanting to try out block printing. “The kit is fabulous and just what I need to get me going. I ve played around with ordinary lino and cheap cutting tools, but this is in a different league and the results of my first effort have given me a real confidence boost. I don t know whether it s the ink, the paper, the tools or the ‘lino’, or probably that everything is better quality and so a bit easier for a beginner to have a degree of instant success and so be encouraged to continue.